Every bottle of Great Canadian Water Co's private label bottled water comes from a natural spring comparable to the store bought luxury water brands. A more substantial feel and higher perceived value all with a larger field of view means more label space for your brand. Try it out today! 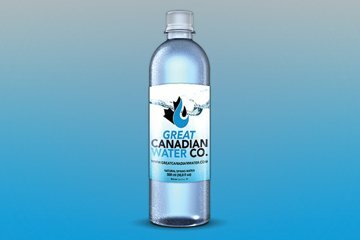 Get piece of mind when you order with Great Canadian Water by seeing a full render of your bottle before your labels are printed. Want to try it out before making a larger commitment? Give us a call. We can do a small order at a reduced rate to let you see what Great Canadian Water Company can do for you! Great Canadian Water Company is proud to create a premier custom labeled bottled water for BC and all of Canada at a price that works for your budget. 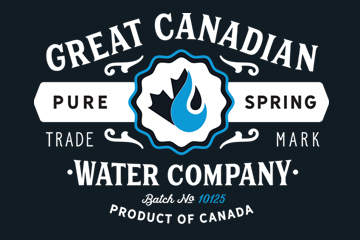 Our mission at Great Canadian Water is to provide your business with the best quality Canadian spring water in the best looking private label package on the market at a cost that makes sense for you. Our Creative Department can assist with your current design or design a new label for you based off of your existing brand. Our creative and customized warehousing services save you space and money. At Great Canadian Water we inspect every order before it ships to assure our clients the best possible results. We only work with PET bottles that are 100% Recycleable. We pride ourselves on our relationships with our customers and forming a relationship by earning trust. Great Canadian Water has several delivery options including residential delivery. A MESSAGE FROM THE PRESIDENT OF GREAT CANADIAN WATER CO. 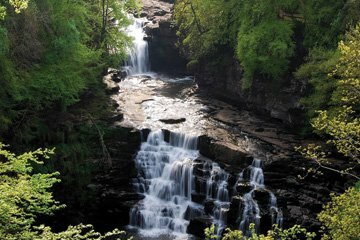 The founders of Great Canadian Water Company have been privileged to see the high peaks and the low valleys of the private label water industry. We know the value of honesty and the importance of great customer service. Our goal is to create a relationship of trust that Great Canadian Water can meet all your private label water needs. We want you to feel cared for at each step of the process and receive a high quality product using great tasting natural water and a high definition label which emphasizes your brand and impresses your customers. Great Canadian Water Co. was founded with one goal in mind, provide a premium natural water option to our customers at a competitive price and follow it up with great service. Great Canadian Water Co. stands behind a great product. We start with all natural spring water or natural glacier water, the water is bottled using only BPA free 100% recycleable PET and rPET bottles which are finished up with a high definition label. We believe this makes Great Canadian Water Company the premier option for personalized water bottle labels BC and all of Canada. Beyond a great product, Great Canadian Water Co. stands behind our service. The founders believe strongly that honesty, high character and a good attitude make for a great company and a great work environment. It is imperative that our customers feel comfortable and respected while a long term trust is built by reliably meeting and surpassing expectations. Let us know a general idea of the order size and we will do the rest. Each case contains 24 bottles and each pallet for shipment contains (up to) 72 cases. Select Ultra Short Run for orders of less than 72 cases and Pallet+ for orders of more than 72 cases. If you're looking for a company that goes to the extra mile to make sure their customers are taken care of, you've found it." Their customer service can't be beat, it stands alone in the industry." It was nice to provide something to people that they needed. I was glad that the labels were high quality, allowing the bottles to be submerged in water and ice and not compromise the quality of the label when it was pulled out." I have always received courteous service from Great Canadian Water. Everything is consistently communicated in a professional and timely manner. The water bottle looks great! The water tastes great and is truly Canadian!" Your company logo on your own private label bottled water drawn from a certified spring in pristine British Columbia. Great Canadian Water offers Spring Water with a desireable PH balance in a high quality package, all at a price that competes directly with the filtered municipal source water brands. Contact Great Canadian Water Co.. Copyright © 2018 Great Canadian Water. All rights reserved.